The hikes in the first four listed areas are in the Alpine Lakes Wilderness Area roughly boundried by US 2 on the north, I-90 on the south and SR 97/970 Salmon La Sac to the east. 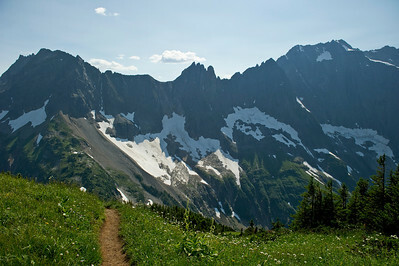 Out of state/Country hikes such as Oregon, Switzerland, B.C. and Alberta, Canada, Lake Tahoe area, Matthew Meadow, Ca are not listed. Hikes in Mt Rainier National Park are listed there. Annett Lake - Denny Creek and Melakwa Lake - Granite Peak - Kendall Katwalk - Lake Laura, Lake Lillian and Rampart Ridge- Lake Margaret - Lake Pratt, Olallie Lake, Lower Tuscahatchie and Talapus Lake - Mason Lake --Mount Defiance - Rachel Lake, Rampart Lakes and Lila Lake - Rainbow Lake and Island Lake - Snow and Gem Lake (Alpental) - Taylor River Trail, Martin Creek and Otter Falls.